Snap Inc.’s logo on the New York Stock Exchange floor in February 2018. Snapchat owner Snap Inc. has had a rough go of it lately. Its stock, which hit the market at $17 per share (and peaked at $29.44) during its initial public offering in March 2017, is in the gutter—a high of $6.54 so far in 2019. It’s seemingly hit a wall in growth, and it’s still bleeding cash. A major update to the app last year was hated on by so many users Snap was forced to issue a redesign of the redesign. 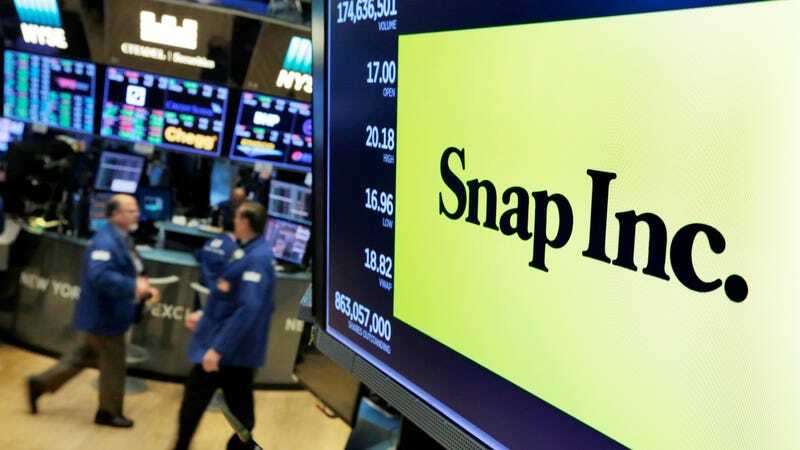 According to Reuters, sources at the company say Snap is now considering “what was once unthinkable”—namely, switching up its format so that public Snaps last much longer before being deleted (not that big a change) or simply become permanent (a much bigger change). It is also considering a switchup that would “reveal the identities” of users who make public posts. Snapchat has also been losing users. It posted a three million daily user loss in Q2 2018, then lost two million more in Q3 2018. Snap has also been brutalized by Facebook subsidiary Instagram, which is flush with cash and claims to have well over 400 million daily active users. A poll in October 2018 found that Instagram may be overtaking Snapchat in monthly use among teens, as well as found many more of them “prefer brands contacting them about new products” on the former than the latter, CNBC wrote.